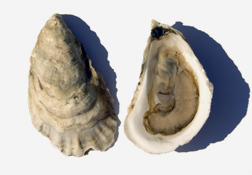 Also known as “glidden point”; this oyster is from the hog island area of the Damariscotta river. This thick shelled oyster is meaty, firm and salty. The flavor is sweet and mildly salty with an almond-like finish.